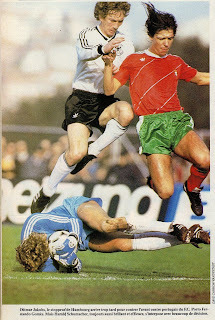 -Match number 254 for Portugal and number 506 for West Germany. -Porto’s players had wanted the match to staged at their home ground, however Portugal mamager Torres refused because he felt the heavy ground would favor the Germans. -West Germany and Portugal were playing one another for the fourth straight year. -Portugal’s Chalana had been sidelined by a long term injury for the entire first half of the season. He had recently returned, however, he was not selected for this match. -Portugal’s Jaime Pacheco had also been sidelined with injury and had only played 3 league matches before he was selected. -Portugal’s starting lineup was made up of 8 FC Porto players. -Both teams’ captains were goalkeepers and both were earning their 56th cap. -Germans Rummenigge, Forster and Thon were all flu stricken and were ruled out the day before the match. -In German captain Rummenigge’s absence Harald Schumacher captained Germany. -Both managers played in the 1966 World Cup in England. -Germany’s Hans-Peter Briegel was the only foreign based player on either side. -This was Germany’s first away win in Portugal since 1954. -Portugal captain Manuel Bento (June 25, 1948-March 1, 2007) passed away due to a heart attack. -The following players were involved in the Champions Cup Final of May 27, 1987 between FC Porto and Bayern Munich, which Porto won 2-1. The Portuguese players: Joăo Pinto, Augusto Inácio, Jaime Magalhăes, Antonio Sousa, António André, Paulo Futre and Germay’s Lothar Matthäus. -West Germany’s FC Barcelona midfielder Bernd Schuster was still boycotting the national team. He would become teammates with Portugal’s Paulo Futre at Spanish club Atletico Madrid (1990-93). -Paulo Futre would also become teammates with Germany’s Rudi Voller for a few months at French Club Olympique de Marseille during fall of 1993. -Both teams qualified from this World Cup qualifying group. -The last match between the two nations was a 0-0 tie on June 14, 1984 during the UEFA Euro 1984 Championships. Germany players: Harald Schumacher, Hans-Peter Briegel, Lothar Matthäus and Rudolf 'Rudi' Völler and Portugal players: Manuel Galrinho Bento ,João Domingos Silva Pinto , Antônio José Lima Pereira ,Eurico Monteiro Gomes ,Carlos Manuel Correia dos Santos ,Jaime Moreira Pacheco ,Antonio Augusto Gomes de Sousa and Fernando Mendes Soares Gomes were the only players still remaining from that match. 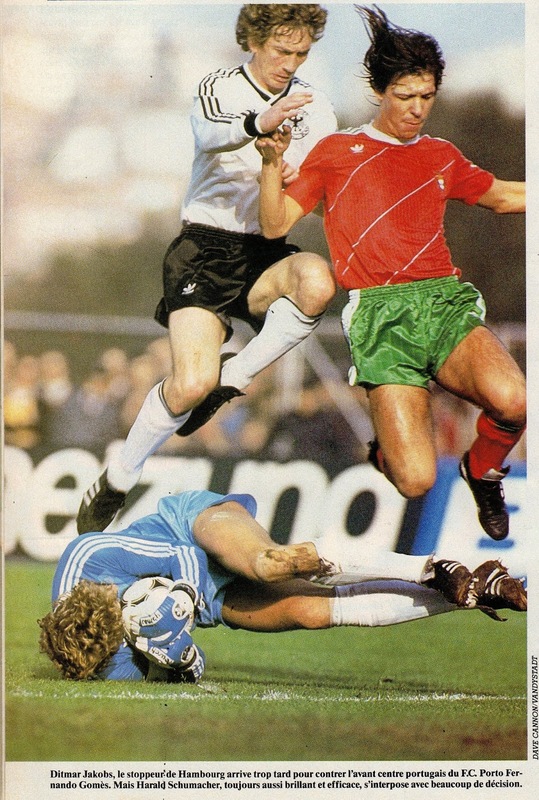 -West Germany’s previous victory over Portugal was a 3-1 win on February 17, 1982. Germany players: Harald Schumacher, Hans-Peter Briegel, Lothar Matthäus and Pierre Littbarski and Portugal players: Manuel Galrinho Bento and Eurico Monteiro Gomes were the only players still remaining from that match. -Portugal’s previous victory over West Germany was a 1-0 win in Lisbon on February 23, 1983. Germany players: Harald Schumacher, Hans-Peter Briegel, Lothar Matthäus , Rudolf 'Rudi' Völler and Pierre Littbarski and Portugal players: Manuel Galrinho Bento ,João Domingos Silva Pinto , Antônio José Lima Pereira ,Eurico Monteiro Gomes , ,Jaime Moreira Pacheco and Fernando Mendes Soares Gomes were the only players still remaining from that match. -The next match between the two nations would be a 1-0 away win for Portugal on October 16, 1985, which effectively qualified Portugal for the Mexican World Cup of 1986. Germany players: Harald Schumacher, Hans-Peter Briegel, Ditmar Jakobs, Thomas Berthold, Matthias Herget and Pierre Littbarski and Portugal players: Manuel Galrinho Bento ,João Domingos Silva Pinto , Augusto Soares Inacio, , Carlos Manuel Correia dos Santos ,Jaime Moreira Pacheco and Fernando Mendes Soares Gomes were the only players still remaining from that match. Carlos Manuel would score Portugal’s goal in that match. This was West Germany’s first away loss in a World Cup Qualification match. -Germany’s next victory over Portugal would also be a 2-1 away win on February 21, 1996. -Match number 650 for England and number 639 for Brazil. -England Captain Bryan Robson missed this match through injury. David Platt took his place in the lineup. Terry Butcher skippered in Robson’s place. -This was England’s first match at Wembley, as now an all seater stadium. -Brazil’s manager Lazaroni had introduced the sweeper system to Brazil’s national team for the first time when he took over the year before. England would also employ the sweeper system for the first time during the upcoming World Cup. -In the months leading up to this match, Brazilian defender Josimar was axed from the team due to off field problems, which included arrests and fights. -Both teams had been on a 14 match unbeaten streak prior to this match. England had not lost since losing to 1-3 to USSR on June 18, 1988 during the UEFA Euro Championships. Brazil had not lost since losing 0-1 to Switzerland on June 21, 1989. -England’s Chris Waddle was club teammates with Brazil’s Carlos Mozer at French club Olympique Marseille. -Bryan Robson, England’s absent Captain, as manager of Middlesbrough FC signed both England’s Paul Gascoigne in 1998 and Brazil’s Branco in 1996. -Luis Muller had a goalbound shot saved on the goal line by Stuart Pearce’s hand. Despite protests, the referee did not see the incident and no penalty was awarded. -Brazil’s Romario was missing through a long term injury. He was operated the day before the match. -England’s Neil Webb was also missing due to a long term injury. -The goal was scored following a corner taken by Peter Beardsley, flicked on by John Barnes and headed in by Gary Lineker. -Both managers left their posts following the 1990 World Cup to manage clubs. Lazaroni managed Italian Serie A club Fiorentina, while Bobby Robson managed dutch club PSV Eindhoven, where he would be the manager of Brazil’s absent striker Romario. Both managed clubs in Portugal during their career, Lazaroni managed Maritimo, while Robson managed both Porto and Sporting Lisbon. -Sebastiano Lazaroni also managed Jamaica, the home nation of England’s John Barnes, on two separate occasions. Barnes himself managed Jamaica at one point. -Brazil manager Sebastiano Lazaroni and England’s David Platt both managed and played respectively for Italian Serie Club AS Bari, though in different seasons. -England’s Waddle, Walker and Woods all eventually became teammates at Sheffield Wednesday. -Brazil’s Valdo, Ricardo, Aldair were managed that season by future England manager, the swede Sven Goran Eriksson. Who also managed both England’s Walker and Platt when they played at Italian Serie A club Sampdoria. -England’s Platt, Walker and Brazil’s Silas all played for Italian Serie A club Sampdoria at one point. -The last match between the two nations was a 1-1 tie also at Wembley on May 19, 1987 during the Stanley Rous Cup. England players: Peter Shilton, Gary Stevens, Stuart Pearce ,Terry Butcher, John Barnes ,Chris Waddle ,Peter Beardsley ,Gary Lineker and manager Bobby Robson and Brazil players: Paulo ‘Silas’ ,Carlos ‘Dunga’ , Luís ‘Müller’ and ’Valdo’ were the only players still remaining from that match. Gary Lineker scored in that match as well and also with a header. -England’s previous victory, as well as its last and only away win, over Brazil was a 2-0 win at Maracana Stadium on June 10, 1984. England players: Peter Shilton, John Barnes and manager Bobby Robson and Brazil players: ‘Mozer’ and ‘Ricardo’ Raimundo Gomes were the only players still remaining from that match. John Barnes scored his most famous goal of his career in that match, where he dribbled past many players to score a solo goal. -Brazil’s previous victory over England was a 1-0 win also at Wembley Stadium on May 12, 1981. There were no only players still remaining from that match. However, England’s missing captain Bryan Robson did play that match. -England has not defeated Brazil since this 1990 match. -England’s last win over Brazil at Wembley was a 4-2 win in May 9, 1956. - The next match between the two nations, as well as the next at Wembley, would be a 1-1 tie on May 17, 1992. England players: Christopher Woods ,Gary Stevens ,Stuart Pearce ,Des Walker David Platt and Gary Lineker and Brazil players: ‘Mozer’ ,’Ricardo’ Raimundo Gomes ,Claudio ‘Branco’ , ‘Bebeto’ and ’Valdo’ were the only players still remaining from that match. David Platt would score England’s goal in that match. He would also score vs. Brazil in 1993. During that match Gary Lineker failed to score from penalty kick and missed his chance to equal Bobby Charlton’s record of 49 international goals. -Brazil’s next victory over England, as well as its next at Wembley, was a 3-1 win also at on June 11, 1995 during the Umbro Cup. England players: Stuart Pearce , David Platt ,Paul Gascoigne and Brazil players: ‘Jorginho’ ,’Aldair’ , ‘Dunga’ were the only players still remaining from that match. -Brazil’s Luis Muller almost joined English Premier League Club Everton in 1994, but he backed out in the last minute due to financial reasons.